Today I get to write about two of my favourite cats: Max Scherzer and Brandon Inge. Max Scherzer pitched 7 innings, allowed 3 hits, 2 runs, 4 walks and fired 8 Ks in a 5-3 Tigers win over the Indians. Scherzer is tied with Justin Velander for 2nd in strikeouts with 142 Ks. Max has thrown 32.1 fewer innings than JV. Seattle's Felix Hernandez leads the majors with 147 Ks. 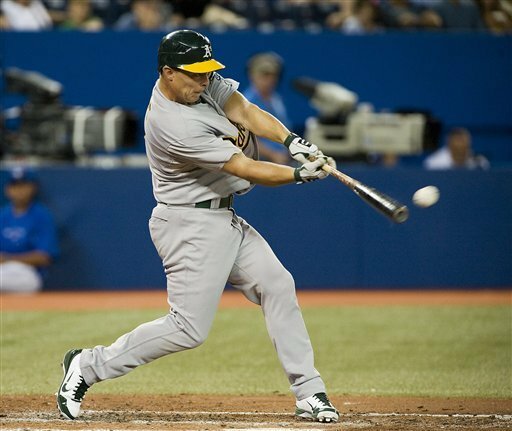 Everybody knows by now - the Oakland A's laid the beatdown on the Toronto Blue Jays to the tune of 16-0! Coco Crisp hit 2 'taters, Chris Carter hit a homer, Yoenis Cespedes had 2 doubles and Brandon Inge hit an 2 RBI double. It was the Blue Jays worst shutout loss ever. Starter Ricky Romero lasted a whole 1 1/3 innings! Toronto even used catcher Jeff Mathis to pitch the 9th inning!! To make matters worse, the Jays lost catcher J.P. Arencibia after his right hand was broken by a Brandon Inge foul tip.